Today deserves one additional post. This one was first posted in Strummerfest Philosophy. Here's an example of how complex the issue of suicide is. Sometimes the objective of giving hope to the victims is not enough. They need protection as well from those who callously steal their hope. There is no time or place when bullying is acceptable. There is no circumstance in which parents, teachers and other caring adults should not intervene..
Today is "Blog Action Day"
Today is Blgg Action Day. Considering this blog only started up yesterday, this was news hereabouts, but here we are. Today's topic? Human Rights. 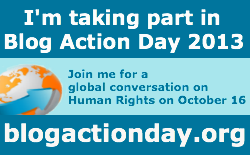 In particular, the Blog Action website points us toward the Universal Declaration of Human Rights. Read it here. So, Strummerfest fans, what would you say is the state of human rights today? There are several things to say about that, but let's just point out two: (1) It's pretty simple, isn't it? Stop being greedy; stop being selfish; and things will get better. In this blogger's other life, he teaches a fair bit about law to community associations. Inevitably every lecture comes down to this: if you treat other people the way you'd like to be treated, and if you don't allow yourself to lose sight of their humanity, it is almost impossible to break the law, and your community will, on the whole, be a happier, healthier, better place to live. There's really not much more to it than that. And then there's point (2): it starts with you. Strummer admits, "I am one of them." That's the first step to making change -- recognizing where it really begins. It's no good preaching about human rights in the world at large if you don't treat your own neighbours, and, indeed, your own family, well. All moral accomplishment begins and ends in the moments that individuals make choices within the context of their private lives. Be good, folks, and the humanity will follow.